No two rehearsal rooms are ever exactly the same. They are defined as much by personalities as they are by structures and schedules. One of the usually unsung roles in the room is that of Assistant Director. On Kryptonite, that role is held by Adelaide-based director Shona Benson. Here, she opens the door to the Kryptonite rehearsal room to give us a quick taste of what it's like. Entering Rehearsal Room 1, deep in the vaults of Adelaide's Festival Centre, I was filled with a sense of trepidation. 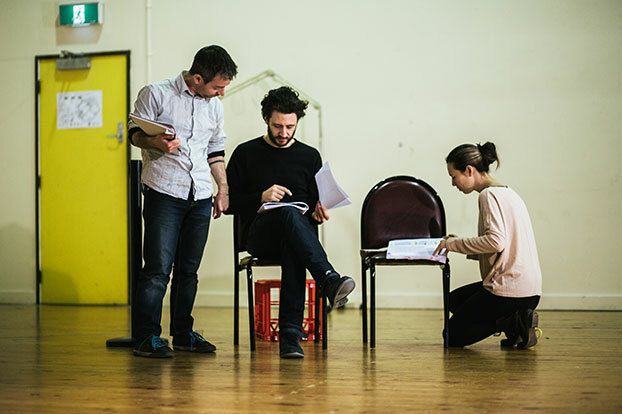 Months earlier, State Theatre Company of South Australia's Artistic Director, Geordie Brookman, had offered me the opportunity to work with him as assistant director on a new play Kryptonite, presented in conjunction with the Sydney Theatre Company. Over the intervening months, I'd read the script, several times, done my own background and research, and was now dying to get started. But there was no denying day one nerves. Thankfully, I had little to fear. I was greeted by warm hellos and smiles, coffee and, as it was Geordie's birthday, some rather good chocolate cake. Alongside Krypronite's cast and crew, many of STCSA's core were in the room for the kick off too. As everyone was introduced there was a respectful acknowledgement of all the roles supporting the production, ranging from marketing and workshop to sponsorship and development. After all the initial formalities (and a little more cake) most left leaving just the actors, director, stage manager, the writer, STC's Literary Manager and me. It was a sign that the real work was about to begin. Listening to a new play read aloud for the first time is incredibly exciting. It is an honour to know that no one else in the world has heard it before; it's shared solely amongst those in the room. At the end of the read through there is an audible release of tension. It's started. And, jointly, everyone embraces the challenges ahead in unravelling and staging this fascinating tale. The play is by no means straightforward. It is a love story that spans 25 years and is set against a backdrop of vast cultural differences and political wrangling. The next few days are spent in deep discussion and analysis, re-reading and re-writing parts, gaining a deeper understanding of not just the issues in the play but also what's required of the two characters within it. The playwright, Sue Smith, is incredibly generous in her giving over of the text. There is no doubt she trusts Geordie implicitly. Having worked with him last year on the Kreutzer Sonata, the two have a clear admiration of each other's talents. As we discuss the meaning and sense of the words on the page, I wonder if she is ever amused or baffled by our interpretation. When I ask her, she claims that she enjoys it and often, on hearing the words read out loud, she discovers new things too. Her presence in the room is an undeniable privilege and her soft, gentle manner imbues a strong sense of collaboration and openness. It's not long before Geordie moves proceedings away from the tabletop discussions and onto the floor. With a minimal set there's not much to see, just the outline of the stage area and a few chairs. Various props accumulate each day on a side table. But, as the script slowly begins to take a shape, there is already chemistry between the two of actors. Sue is clearly pleased. Whilst Geordie crafts each scene and the actors respond to his direction, much of my time is spent watching, thinking, making notes, keeping a close eye on his vision for the piece so that I know what I might need to do to support him. The time flies and before we know it, it's Friday. The end of week one.